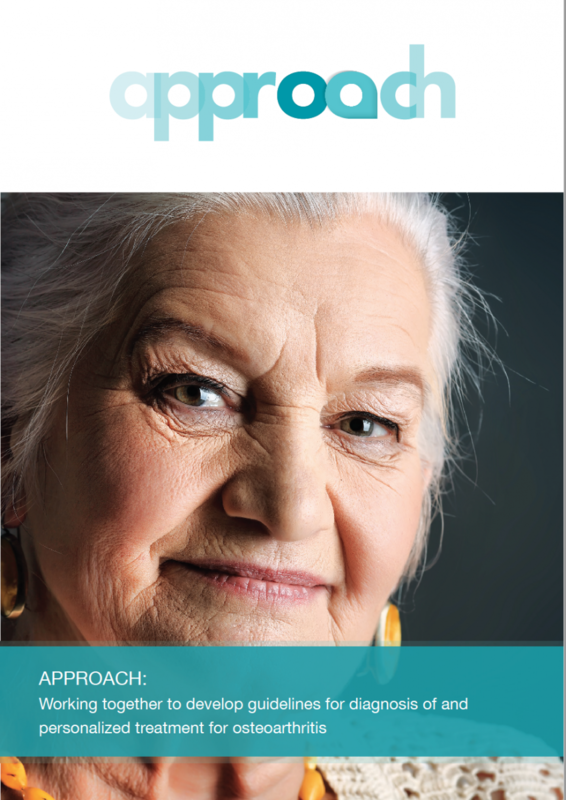 The APPROACH consortium brings together a highly qualified and multidisciplinary group of stakeholders that will set up – for the first time – a broad database of different osteoarthritis (OA) patients as well as a longitudinal cohort based on innovative stratification methods, to identify different OA phenotypes. This will allow for the development of guidelines for differentially diagnosing the right patient for the right treatment. Clinicians recognize that the diagnosis OA is established late in the disease process, maybe too late to expect much help from disease modifying drugs. Despite efforts over the past decades to develop markers of disease, imaging procedures and biochemical marker analyses need to be improved and possibly extended with more specific and sensitive methods to reliably describe disease processes, to diagnose the disease at an early stage, to classify patients according to their prognosis, and to follow the course of disease and treatment effectiveness. In the coming years, a better definition of osteoarthritis is expected by delineating different phenotypes of the disease. Treatment targeted more specifically at these phenotypes might lead to improved outcomes. The APPROACH consortium contributes to this by combining biomedical data for >10,000 patients and controls from eight existing cohorts into a unified bioinformatics platform. With the help of complex algorithms, bioinformaticians will comb through this central database to identify subtypes or phenotypes of osteoarthritis. These subtypes will then be validated in a longitudinal clinical study, using existing and newly-developed biological markers. Enrolled patients are an essential part in the APPROACH European clinical study. The APPROACH study will take place in 4 countries: France, The Netherlands, Norway, and Spain. In total, about 300 patients will participate and they will be monitored across four visits over a period of two years. The project will focus on knee osteoarthritis – a very common form of the disease and a major cause of impaired mobility with a large burden on people’s quality of life. This form of osteoarthritis has been extensively examined in large groups of patients. In addition, lots of standardised data, such as x-ray and MRI image measurements, are already available. The results of this 5.5 year program will be used to support the selection of patient cohorts for new disease modifying osteoarthritis drug (DMOAD) clinical trials. Patients will reap the greatest benefits as the identification of disease subtypes will lead to improved diagnostic / prognostic tools and more effective, personalised treatments.